The Cougar is best described as a modern day saddle with traditional features. 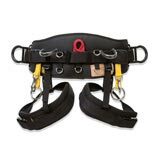 This saddle incorporates an adjustable rope bridge suspension system and a back pad featuring additional layers of memory foam. Weights approximately 6.5 lbs. A perfect transition saddle for the climber looking to step up from a older leather saddle to an up-to-date Cougar. The 4" wide leg pads and extra wide 7" back are constructed from memory foam that conforms tothe legs and back, reduces pressure points, wicks away moisture and does not retain heat for cool,comfortable performance. Back features an additional layer of memory foam for added comfort. 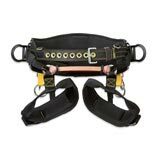 Leg straps and straps attached to bridge are adjustable to provide a comfortable fit. Features adjustable accessory leg straps that keep your memory foam leg pads positioned for optimum comfort. Fixed position side dee rings feature a two-bar design and offer easy access _ you can snap in with just one hand!